Srinagar, the city of Kashmir, has been growing at an alarming pace both in terms of its population size and area extent. This has resulted in alarming variation in housing availability across the space. A considerable number of people live in decayed, overcrowded houses in the downtown, the Shehr-e-Khas. Densely packed with a space of less than a meter apart, these homes have inadequate civic and hygiene facilities. These houses are home to more than two families. The peripheral expansion, although relatively new, is equally in a mess. There is no planning and the construction is going on unabated. Experts blame the Srinagar Development Authority (SDA) for the mess in urban housing. Set up in 1970, with an objective to promote and secure the development of local area, according to the city plan. It has the power to acquire, hold, manage and dispose of land and other property, to carry out building, engineering and other operations, to execute works in connection with supply of water and electricity, disposal of sewerage and other services and amenities and generally to do anything necessary or expedient for purposes of such development. The residential expansion in the city suburbs has mostly encroached upon the productive agricultural land and wetlands thereby posing a considerable threat to city’s ecological setup. “There is an urgent need to regulate the residential growth of the city in a planned manner,” said Drabu. Srinagar’s population explosion during the last century was phenomenal. From 0.122 million persons in 1901 to 1.225 million in 2011, the increase is nearly tenfold, a 900 percent growth with a net increase of 1.103million persons, reveals a study. Blaming unplanned development for comprising fragile environmental resources, the draft Master Plan 2035 states that haphazard urbanization has made the summer capital vulnerable to floods and other disasters. “Last four decades of urbanization has compromised these fragile environmental resources in Srinagar. Due to rapid growth of population and unplanned urbanization, the quality of environment is fast degrading,” reads the Plan draft. “Unfortunately, the water bodies and their connecting ecosystems have not been researched in detail. Khushalsar and Anchar wetlands are facing serious threats from unplanned urbanization along their shoreline. Apart from huge environmental and ecological value, these water bodies/wetlands are potential sites for tourism and local economic development. The spatial expansion of Srinagar is a testimony to the fact that wetlands and flood absorption basins have become soft targets for urbanization. Drabu blames the “organized mafia” for the Srinagar disaster. But he argues that the incompetence of SDA has allowed the mushrooming of the mafia, which acquires land and develops unplanned colonies. These habitations have 10-ft roads and even lack basic facilities like water and electricity. The SDA has not by itself been able to construct modern housing colony with all the facilities that could put a break on the unplanned constructions across the city and its peripheries. “The Srinagar city is in the face of physical threshold and constraints, and is likely to extend and grow. 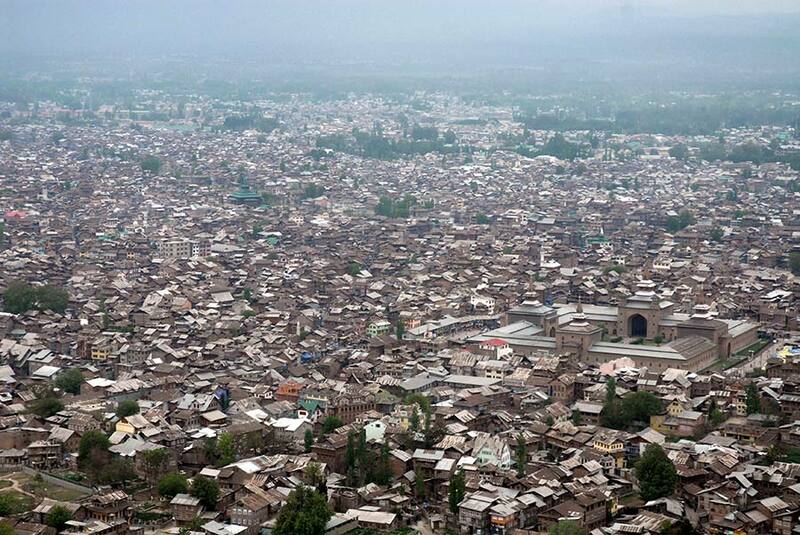 In case this growth is not channelized and regulated, it is likely to encroach in the direction of an urban settlement pattern characterized by unorganized, unplanned mess and haphazardness,” believes Towseef Yousuf, a research scholar at Kashmir University who works on urban problems and planning in Srinagar. By 2021, Srinagar will be home to 18 lakh people and will utterly run out of space for new constructions and infrastructural development. SDA’s documents suggest the interesting dichotomy about two cities of Srinagar, one that is in official records and the other which exists on ground. The government’s only step towards resolving the issue has been to proclaim the escalation of local area of Srinagar city from the current area of 417 km2 to 757 km2 in the Master Plan 2012-2032 currently under formulation. SDA has completely failed in providing planned and affordable housing. “During the past six decades of its existence SDA has developed a single housing Colony at Bemina, which unfortunately has turned out to be the biggest slum in Srinagar. It has no project in hand right now,” said Drabu. The government too did not lag behind and constructed many official buildings in prohibited areas. The office of the SDA, which is supposed to ensure planned implementation of development schemes for the city, was itself built on swampy land in the Bemina locality, which actually is meant to be a flood channel. Besides, around two dozen government offices, including Haj House, Housing and Urban Development Department, Town Planning Organisation, J&K State BOSE, State Institute of Education, DIET, a city hospital and Forensic Science Laboratory along with many offices that have come in this area, actually supposed and anticipated as a Flood channel. The present mess including lack of adequate spatial and other amenities in most of the housing colonies and commercial centres is because of the failure of Srinagar Municipal Corporation (SMC) and SDA in enforcing even the minimum basic regulatory mechanisms while according building permissions. The city is witnessing huge shortage of houses. Urban planners insist that the proposed land use for Srinagar city by year 2032 as prepared by SDA is not in tune with urban needs vis-a-vis the future expansion and growth of the city. “Ultimately, growth is obviously going to be more of problem than solution,” Towseef said. Drabu believes that impetus must be provided to generate newer growth centres and the existing ones must be revived. “Proper investments in developmental sectors like infrastructure, education is needed, which will relieve existing pressure on Srinagar city.” suggests a policy that will systematically decrease inner city area population, keep the middle areas almost static and help increase surrounding outer areas.